A healthy lunch or dinner admission does not get better than home made tomato soup! 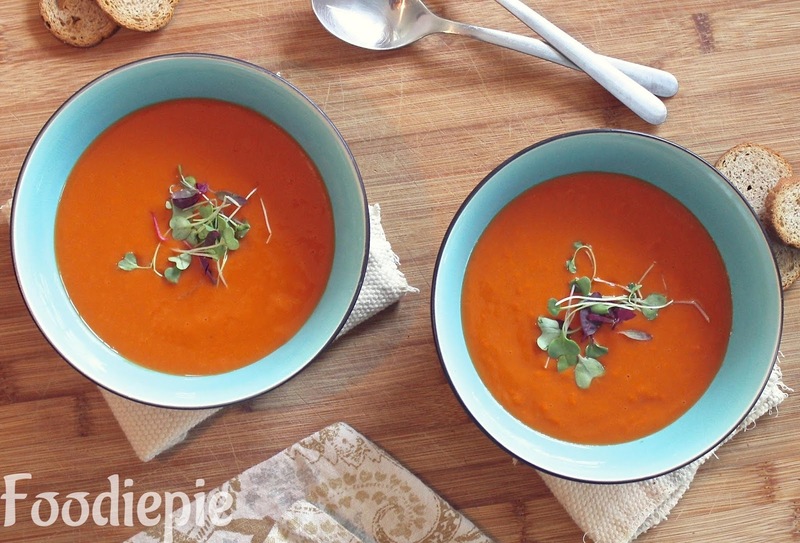 Believe it or not, this easy tomato soup recipe is completely delicious! Especially with this easy tomatoes soup recipe does not seem much to make a healthy, flavorful soup! Of course, you can swap the butter for olive oil to make it healthier and leave the cream, but this time I wanted to give it some grace. You can not go wrong with the cream and here, it creates a wonderful creamy homemade tomato soup. I also like butter in tomato soup, this miracle does! Let's Checkout recipe. Step 1 : Dies Tomatoes and carrots into quarters pieces. Step 2 : Add tomatoes,carrots,garlic,black peppercorn in medium sauce pan.add cup of water and salt,cover and cook until tomatoes turns softer.it will take around 10 minutes over medium flame. Step 3 : When tomatoes and carrots turns softer.Turn of the flame.remove lid and allow them to cool down at room temperature. Step 4 : Blend all the mixture using a hand blender or in the jar of mixer grinder until smooth puree. Step 5 : Strain prepared puree through a strainer in bowl.Discard the residue. Step 6 : Heat butter in pan add 1 teaspoon maida. stir continuously and cook for minutes. Step 7 : Add strained puree slowly for preventing lumps formation. add 1/2 cup water and sugar mix well. Step 8 : Bring it boil over medium flame.when it comes to rolling boil.add salt as per taste. Finally : Turn of the flame and Tomato Soup is ready garnish with cream,coriander leaves and herbs.served it with bread.